Christmas is fast approaching, and I can hardly believe I finished all of my Christmas decorating before December 1st this year! Now, I get to enjoy the most wonderful time of the year focusing on the real reason for the season. Recently, I made a really cool Christmas tree of PVC pipe. I had a Christmas tree shaped wood frame left over from that DIY project — so I thought I would put it to use by making yet another type of window Christmas tree. The PVC tree was made specifically for a window in my eat-in kitchen. 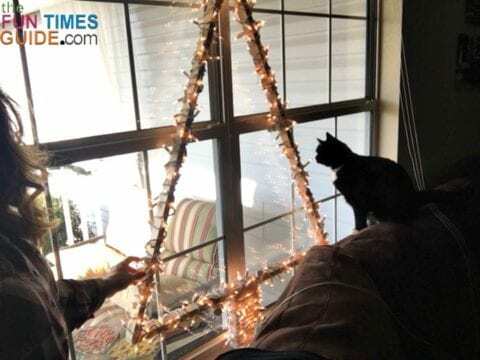 Since I had another large window that wasn’t decorated yet, I figured the best way to put the wood frame to use and light up our front porch window was to wrap some lights around this simple DIY Christmas tree frame! 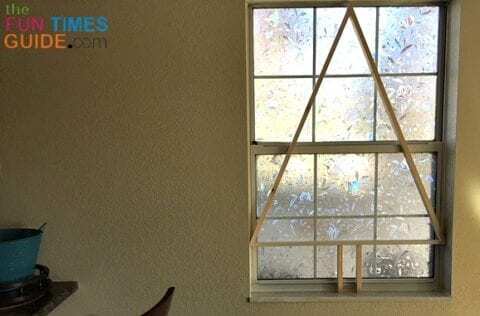 I measured the window space and figured where I wanted this DIY Christmas tree to be placed. I included a tree stem because I wanted some space at the bottom of the isosceles triangle. I created the wood frame using 1-inch x 3-inch x 8-foot pieces of wood trim. I first measured the length, and then used a miter saw to cut the required angles — using this formula. I glued the wood frame together with Gorilla Glue. I started with the rectangular base and basically built the frame up by gluing the pieces together while it sat within the window frame. Then, I waited a full 24 hours before touching it — to ensure that all of the glue was dry. I screwed the corners and angles of the wood frame Christmas tree together for added stability. I wrapped the entire wood frame of this DIY Christmas tree using 3 strands of white lights. I started at the stem (leaving enough slack to reach the wall outlet) and worked my way up. I pulled up the blinds and placed the Christmas tree frame on the window sill. The frame supports itself — so no further anchoring was required. 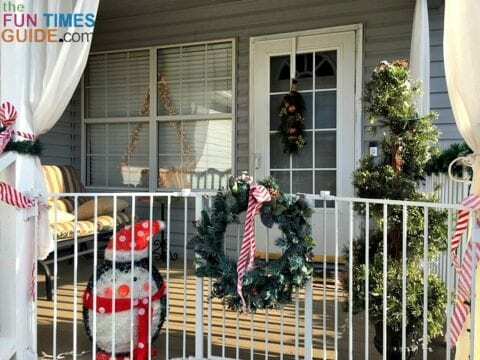 At night, this front porch window Christmas tree is the perfect addition to our other Christmas decorations. I love how the outline illuminates the shutters from the inside too! This is a simple and lightweight design for a DIY Christmas tree. By adding lights to this simple wood frame Christmas tree, you can have a really pretty window Christmas tree that works well in almost any window you choose — providing it has a sill to stand on. You don’t have a lot of space. 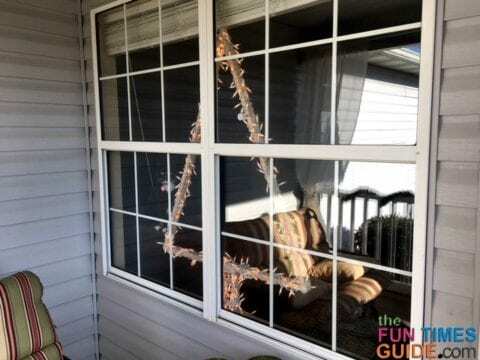 There’s a window on one side of your house that could use some Christmas love but is too hard to reach from the outside. 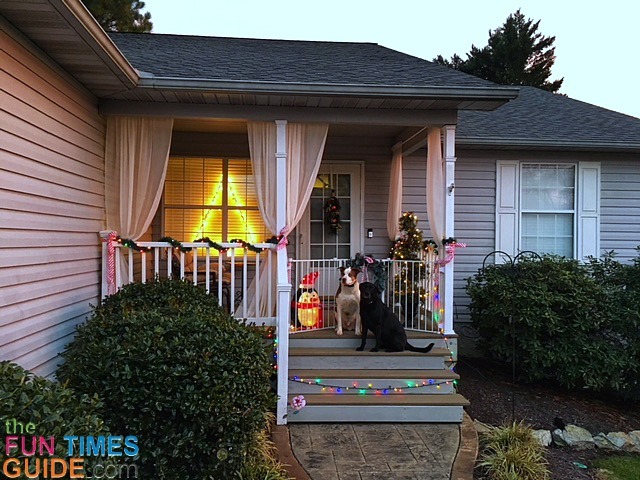 I hope you enjoyed this DIY Christmas tree tutorial… Happy decorating!